BSNL has announced the promotional offer for Prepaid mobile customers on specific days under Prepaid mobile services. 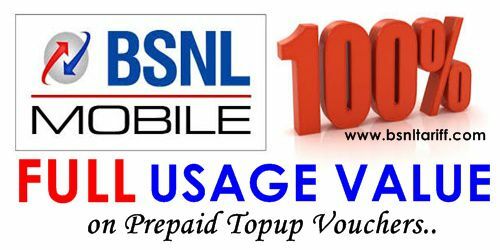 State run Telecom Company Bharat Sanchar Nigam Limited (BSNL) offering Full Usage Value on Topup denomination of Rs.160/- (Including Service tax) on specific days of i.e on Saturday and Sunday for Prepaid mobile customers from 16th June, 2016 onwards. As per latest information, BSNL Gujarat Telecom Circle Competent Authority has announced Full Talk Value on Topup denomination of Rs.160/- on Saturday and Sundays as promotional basis. The above offer will be implemented with effect from 16th June, 2016 and available upto 10th September, 2016 as promotional basis. Note: This offer is available on Saturday and Sundays only across Gujarat Telecom Circle only.